“In one of the last studies there is a question: “Will you sell your vote?”. 5% of the respondents have given a positive answer, meaning that around 150000 people are ready to do it, and not everyone openly admits it”, commented professor Mikhail Konstantinov for the morning program of Nova Tv "Hello, Bulgaria". Mr. Konstantinov has stated that nearly 200 000 votes have already been bought. According to professor Konstantinov the vote-buying practices are proportional to the partisan power: “The larger party has more money and therefore can buy more votes. If you disperse these votes however, the electoral outcome won’t change the partisan balance”, has added the professor. “If we agree that 200000 votes are actually bought for 25 euro each, than we are speaking about 5 million euros, invested in this practice. Add up the expenses for organizing, logistics and protections of such criminal schemes, and we will begin a real conversation about the unreachable people with high political influence, behind these fraudulent practices”, said Antoaneta Tzoneva from the Institute for Public Environment Development. “Every vote that has been bought corrupts the electoral process and leads to demobilization.”, added Mrs. Tzoneva. 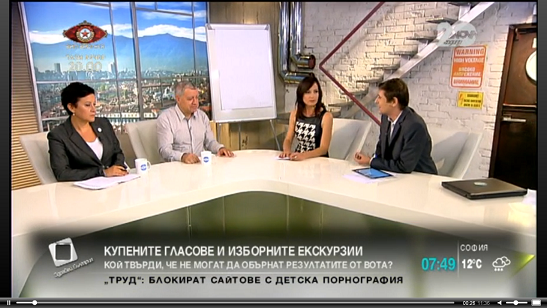 The entire discussion (in Bulgarian) may be viewed in the video file.